An Eastern Cottontail turns its head at Elk Forest WMA. 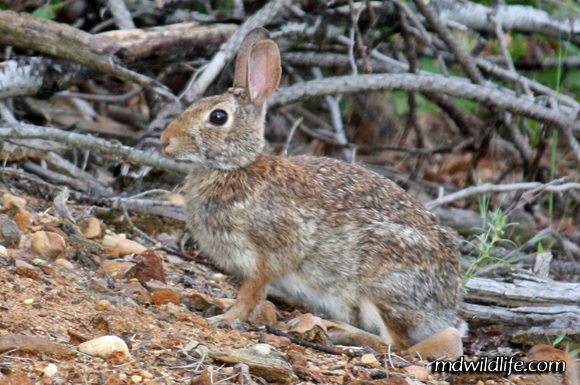 The Eastern Cottontail (Sylvilagus floridanus) is probably the most common rabbit you will see in the state of Maryland. It can be found in woods and forest, around wetlands, open fields, backyards, parks and of course, wildlife areas. The Marsh Rabbit has smaller physical features (ears, eyes, legs) compared to the Eastern Cottontail, and beacause of this, it is a little easier to identify. The Swamp Rabbit – on the other hand – looks almost identical to the Eastern Cottontail. The Swamp Rabbit is usually a little larger, but it’s not like I carry around a scale to tell the difference between a two-pound rabbit and a four-pound rabbit. Between the Swamp and Eastern Cottontail, it’s usually gonna come down to a guess. I have been kicking myself looking at the two photos on this page, wondering if I spotted an easternm or a swamp. The best place to photograph a rabbit is, not surpisingly, in a clearing. if you can spot one first from a difference, it will usually stay still for awhile assessing the situation. 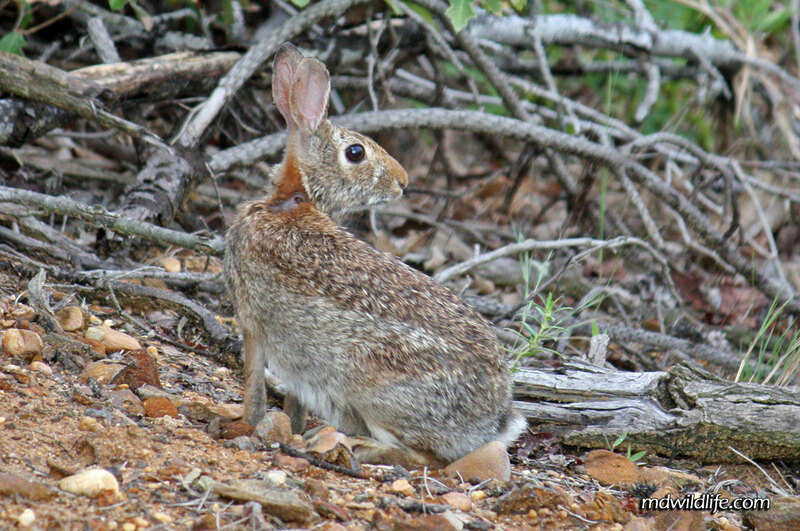 I took the photos above of the same rabbit, during a trip to Elk Forest WMA. I found it was at the very end of the trail, where the park opens up to a long coastline walk along the Chesapeake and Delaware Canal.